It's been a full week since last I posted here, which was not my intent. In fact I should have been typing this Friday, when we had hoped to be under way to Jacksonville, but we had a bit of a false start which I will detail later in the post. 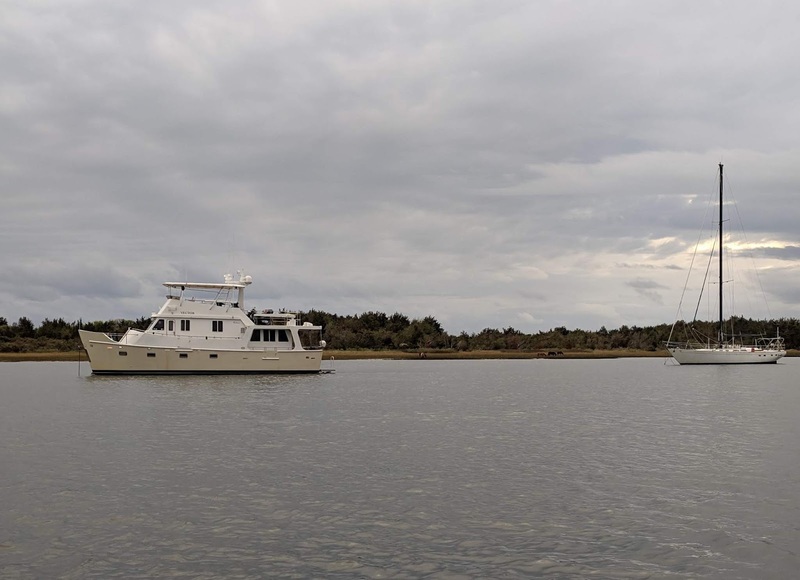 At the moment, we are offshore in Onslow Bay, en route to Masonboro Inlet and Wrightsville Beach, North Carolina. 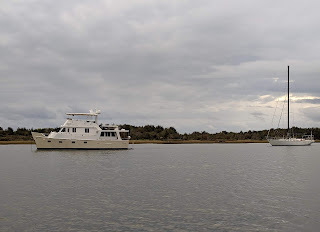 Last Sunday afternoon we arrived in Oriental, NC to a predictably crowded anchorage. The free docks were totally occupied. With light winds forecast from the north for the night, we eased up between two sailboats and dropped the hook in the harbor (map), setting a very short scope. After we got settled we called our friends Gayle and Bill on Spiraserpula, who were docked in a marina one creek over. Vector at anchor in Oriental harbor. That's Flux, our new dink, at the dock. Lots of businesses in Oriental are still closed from the storms, including most of the restaurants in the harbor area. The ones that have since reopened, though, were not open on a Sunday evening at this time of year. Fortunately our friends were able to get a courtesy car from their marina, and picked us up at the dinghy dock. They took us to a casual Italian place they knew, about 13 miles away. The place was run by a family of New Jersey transplants and thus had a very familiar feel. We enjoyed dinner and drinks and had a great time catching up. The last time we saw them was a very brief visit aboard their boat in Georgetown, Bahamas back in March. They dropped us back at the dinghy dock after a very nice evening, and we said our goodbyes, hoping to connect again perhaps in Florida. In the morning we headed back ashore to stroll the town in the daylight. The Provision Company marine and general store is open for business, as is the restaurant and top floor of the Oriental Hotel. The commercial docks seem to be humming along. Everything else is shuttered, including local coffee shop and social gathering spot The Bean and the canonical downtown restaurant, M&M. Construction and repair is ongoing throughout the town. We can see why Oriental is so popular with cruisers, but this visit confirmed what we long suspected: it's a very tight squeeze for Vector, unless we want to spring big bucks for one of the handful of docks that can fit us. We'll not likely return unless we again have friends in town to visit. 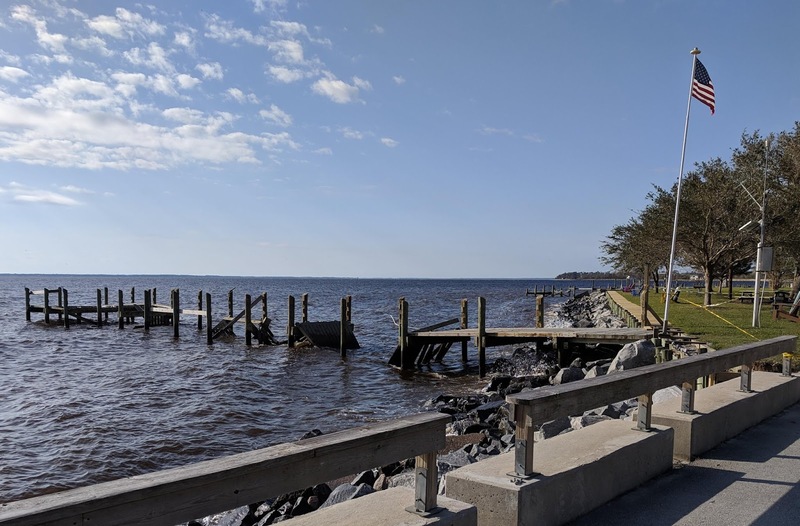 This pier at Lou Mac Park, on the Neuse, was intact before the storms. Monday evening's forecast was for 30kt winds clocking through several points of the compass, and we certainly could not stay in our tight spot in Oriental. After our stroll we weighed anchor and crossed the Neuse to Adams Creek and the ICW southbound. We considered dropping the hook for the big blow in a very secure and familiar spot in Adams Creek, but Bill and Gayle had told us that Beaufort had cleaned all the derelict boats and illegal moorings out of the city anchorage, and we decided to head there instead to see if we could find a spot. The last time we were there we had to settle for a dock and only stayed one night. We came into town via the eastern route past Town Creek, passing under the new highrise bridge that was under construction the last time we passed. The highrise bridge bypasses the old draw bridge, which by rights should have been locked open, as it has been since about January. When we arrived, however, we found a crew working on dismantling the bridge and it was closed; we had to call for an opening, which happens on the half hour, and we ended up station-keeping in Town Creek for fifteen minutes. While we were hanging out, occasionally maneuvering against an outgoing current, I whiled away the time by scanning the marinas in the basin with my binoculars. In very short order I spotted a familiar boat, the Nordhavn 50 Sea Turtle, belonging to Michel and Caroline, whom we had met in the Bahamas. We got no answer on the radio, so I dropped them a note. Within a half hour we had the anchor down in Taylor Creek across from the Beaufort town docks (map). We dropped in the middle of a trio of sailboats, an appropriate distance from each, and set out 60' of chain in about ten feet of water, an amount appropriate for the forecast gusts to 40 or so. We splashed the tender and headed ashore for dinner, having a somewhat disappointing experience at Ribeyes right on Front Street. Vector as seen from the Beaufort dinghy dock. Behind her you can see the wild horses on Carrot Island. Winds were still light and the harbor was calm when we returned to Vector, and we settled in to our chairs to catch up on email, news, and social media. And that's where we were sitting when we were startled by a blast from one of those handheld, canned-air horns close aboard, followed by a spotlight in our window. We stepped out on deck to find ourselves just a few yards from one of the aforementioned sailboats, and a few more yards from another. The latter skipper was the one with the horn, all in a panic and certain we were dragging anchor. Of course we were not dragging anchor, and if we had been, a klaxon sound from the helm would let us know in short order. Nevertheless Louise ran up to the pilothouse to check the plotter and confirm this. What had, in fact, happened, was that the current reversed, as expected, carrying Vector almost to the full extent of her chain in the opposite direction from when we anchored. You'd think that the same current would also be carrying the two sailboats to the opposite ends of their respective swing circles, too. But power boats and sailboats lie to their anchors quite differently, and Vector often lies differently from lighter, shallower power boats too. In this case the current had carried Vector across her circle, while the two much lighter and sleeker sailboats had not yet begun to move, held in place by the weight of their chains and the wind, which opposed the current. While we know we often lie somewhat differently from sailboats, usually we can count on at least some movement in generally the right direction, but, clearly, in this anchorage and these conditions we could not. Waiting until the current picked up, or the forecast winds from a different direction arrived, would solve the problem, but not in time. The unwritten rule of anchorages is that in case of conflict, the newcomer must move, and that was us. So at 9:30, in the dark, on a couple of glasses of wine, we weighed anchor to re-set closer to the channel. We'd thus be swinging out over the channel, but not enough to impede traffic in this lightly-used area. That in itself proved something of a challenge, as the current now had us squarely over our own anchor, and backing up enough to retrieve it cleanly would have me backing right into a sailboat. Between the current, the wind, the other two boats, and the thick mud exerting plenty of grip on the anchor, it took every last bit of boat-handling skill I had, and all 370 engine horses, to get the anchor up and the boat free and clear without hitting anything. We had a marital moment as Louise, on the bow, was giving me maneuvering instructions with which I could not comply, as she tried valiantly to raise the anchor. Once we got re-set all was well, although in the process the guy with the air horn actually weighed anchor and moved to the other end of the anchorage. He either never believed that we were not actually dragging (and who would want to anchor next to a dragging boat in a 40kt storm), or else the aggressive maneuvering that it required to avoid hitting his neighbor suggested to him that I can't drive. Oh well, good riddance. The other guy, the one we came closest to, came by the next day to thank us and check on things. The forecast storm arrived overnight, and our anchor did not move an inch from its new location, even though we actually tightened scope to just 50'. We battened everything down before turning in, and the wind was already howling at 25 or so when I went to bed. In the wee hours, every cell phone in the boat sounded an alarm for a tornado warning -- take cover immediately. Not much you can do on a boat, and we're safest below decks so we just went back to bed. The tornado touched down about four miles from us, in Atlantic Beach, knocking out power. Our anemometer recorded our strongest gust at 43mph. When we first arrived in Beaufort we were not sure when we would be leaving. We prefer to travel out in the ocean from here, but if a decent weather window was not forthcoming within the week, we agreed to make progress down the ICW. By Tuesday the forecast was showing a good possibility of an outside window by the weekend, and we opted to stay in town and wait for it. That let us make dinner plans with Caroline and Michel, who were also waiting for an outside window, for Wednesday, and massage appointments for Thursday afternoon. Tuesday's dinner at Black Sheep was a much more pleasant experience than the previous evening (the well-rated venue is dark Mondays), and Wednesday we hoofed it across town for cocktails aboard Sea Turtle before strolling to their excellent choice of restaurant, Beaufort Grocery. Moonrakers and Clawsons rounded out our dining experiences during our stay. 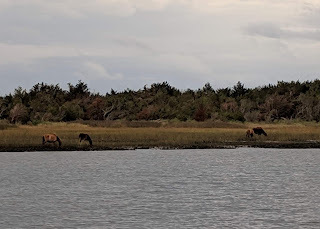 We were fortunate to see the Shackleford Horses across from us on Carrot Island in the Rachel Carson Reserve, and we also had a number of dolphins visit us in the harbor. 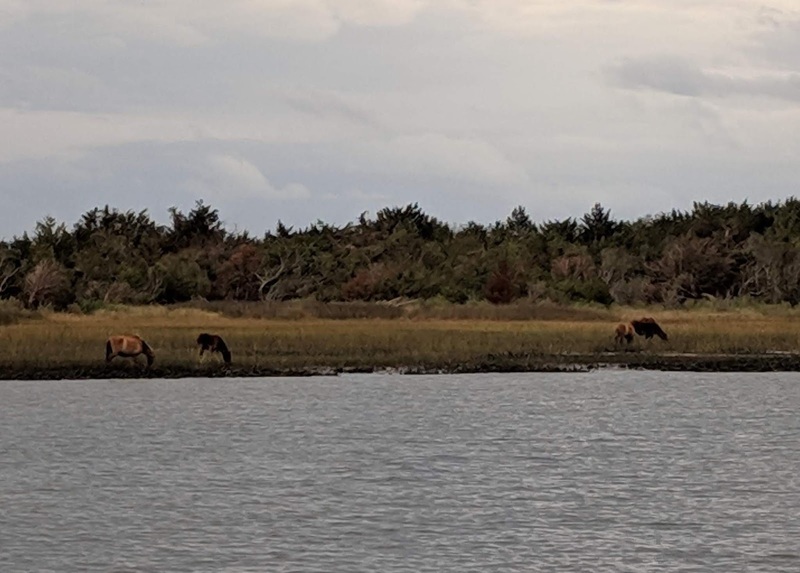 Wild horses of Shackleford Banks as seen from our aft deck. They only appeared one day. Michel and I spent a good deal of time Wednesday evening discussing our common propulsion engine, the Lugger 6108. Few pleasure boats have this engine, and Nordhavn selected it for their N50 model. In what would later prove to be somewhat ironic, I spent some time explaining how to recognize Komatsu part numbers in the Lugger parts book, since Komatsu, who made the base engine, often has the parts cheaper and closer than Lugger. I spent several hours across our stay exploring the whole town on foot, which is how I came across the massage therapist. We were happy she had a cancellation and was able to get us both in on Thursday. While Louise was on the table I hoofed it the mile and a half to the Piggly Wiggly for some provisions for the offshore run, including replenishing the all-important beer supply. And while I was on the table she found a place for a haircut. Friday the anchorage cleared out. A half dozen sailboats, including our neighbor, were headed to the Caribbean on a rhumb line; they called themselves the Back Street Pub Rally after the boater-bar in town where they had been planning over beers. We wished them fair winds and following seas. We might take the same path the next time we try for the Caribbean; easting from the Bahamas was more bashing into head seas than we cared for. 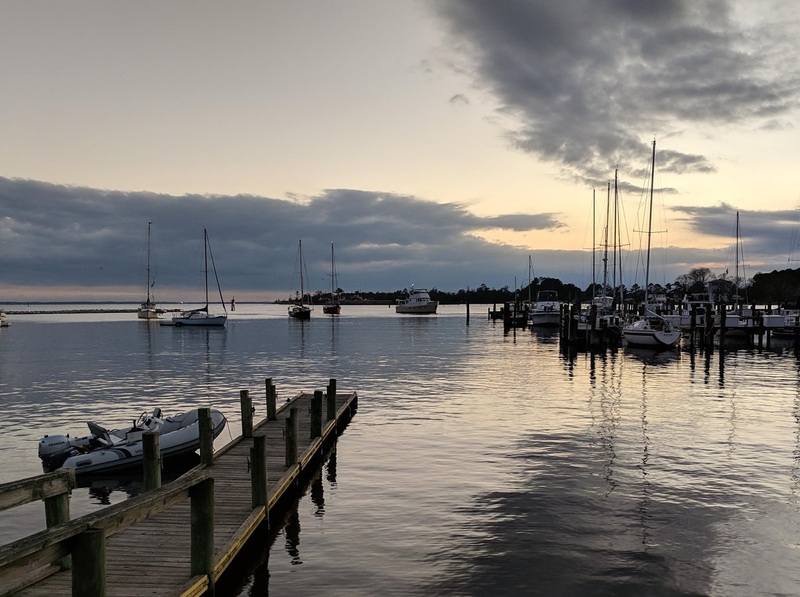 Careful planning for the best offshore weather as well as an optimal arrival time in either Jacksonville or Charleston, our bailout option exactly one day earlier, suggested a nighttime departure, and so we enjoyed Friday in town and one last meal ashore. I spent Friday morning changing the main engine oil; we were a tad past due already, and 55 hours to Jacksonville would have put us unacceptably over. I had to call the Carquest in town to get their last two gallons of Delo 400 as I was a bit short, and their driver met me with it at the dinghy dock. While I was working on the engine I kept getting a strong whiff of diesel, and an inspection of the injector lines revealed one of the injectors to be leaking. We check the engine every hour under way, and so this developed during or since the short run from Oriental. We've seen it before; the return line cracks at the injector body from work-hardening. The only fix is to replace the injector. The last time this happened, under way to Charleston from Fort Lauderdale, the leak was a slow seep and I was able to get all of it with a small bit of sorbent material crammed into the injector well until the next scheduled engine service in Charleston. We reasoned we could do the same thing this time, perhaps changing the sorbent a few times under way, and deal with replacing the injector in Florida. For our overnight watch schedule to work out, Louise needs to go to bed by 8pm, and so we weighed anchor at 7:20 and negotiated our way through the unlit buoys out to the ship channel and out to sea. With over a knot of outgoing current against four-foot easterly seas, the ride out the inlet was pretty violent, with the boat heaving up and down, and the cat, well, heaving. We knew it would get better after turning south and so we pressed on, our egress somewhat complicated by the fact that the Coast Guard has moved all the buoys but NOAA has not updated the chart. Sure enough, things were much improved after turning southwest toward Frying Pan Shoals. Conditions were just barely acceptable to continue, knowing that the forecast called for steady improvement over the following two days. Louise went below to do the engine room check and go to bed. In a few minutes she reappeared in the pilothouse with bad news: the injector leak was worse than expected, and much, much faster than the last time. Was this a different kind of leak than we thought, perhaps in the supply (high pressure) side of the system rather than the return? Even in the return line, could the injector survive another 54 hours of engine vibration without the return line cracking through altogether, possibly stopping us in our tracks fifty miles offshore? Could we find a way to deal with as much as a pint or more of leaked fuel in a safe and responsible way? After careful consideration we decided the safest course of action was to turn around and return to Beaufort, where we knew we could get ashore and where there is a boatyard, should we need one, who could help us deal with the problem. Hindsight is 20/20, of course, and had we known then what we know now, we would have continued west-southwest and diverted to Masonboro inlet, our other bail-out option, some nine more hours of travel, rather than reversed course. What took us 45 minutes with the current behind us now took 1:15 with it against us, and we were back in the anchorage by 9:20. In those two hours another boat had come in and taken our spot, and we had to drop even closer to the channel than before, but we found enough room and settled in for the night. I spent the entire day yesterday working the problem. 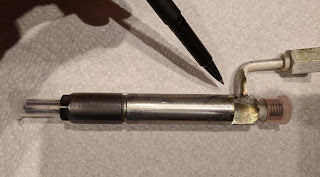 I carefully inspected the injector with a bright light, an inspection mirror, and swabs to determine that, yes, the leak was in the expected spot in the return line. And I called around to the Komatsu and Lugger dealers to see if I could find a replacement, but, unsurprisingly, no parts departments are open until Monday. We never even splashed the tender, opting instead to proceed with the dinner menu we had planned for under way. Our previous leaking injector, showing the weak point where the leak develops. Just before dinner time we got a call on the radio from Bill and Gayle aboard Spiraserpula, who were just coming into the anchorage. It caught me off guard because I thought I heard them docking earlier in the day over in Moorehead City; it turned out they were just fueling up there. Had we not already had the tender well-secured on deck (we use extra tie-downs offshore) and dinner already on the stove we would have tried to get together once again, but with a very early start this morning that seemed a bridge too far. It's another fact of cruising that you will see folks you know out on the water but just out of practical reach, with only a chat on the radio to connect. What I learned yesterday from researching injectors was that there is no Komatsu dealer anywhere near Beaufort, the closest being some 40 miles away. And the nearby Northern Lights dealer, who could get us Lugger parts, is not listed as providing Lugger service. There are, however, two Lugger service dealers and a Komatsu dealer in Wilmington. Knowing we could make no parts progress until tomorrow, and having a good outside window still today, we decided we could handle the leakage and tolerate the risk on the 70-mile daytime run to Wrightsville Beach, a Wilmington suburb. That would put us closer to the parts we need and also make some more progress southbound. And, we'd had our fill of Beaufort for this visit; if we remained, we'd likely be there through the holiday. We weighed anchor this morning in the pre-dawn hours, and made our way down the channel at first light. We again had a knot of current behind us, but with outside seas on a longer period we had a smooth ride out the inlet and the cat-alarm remained silent. As I type we are abreast of Figure Eight Island and have about an hour to the sea buoy. Sea Turtle left on Friday and is likely already to Florida, and we heard Spiraserpula come out behind us this morning. They had Masonboro as a bailout option but from their track and radio transmissions I see they are headed past Frying Pan with a goal of St. Marys. Perhaps we'll run into either of these boats somewhere in Florida. It's been a good ride out here today and I anticipate having the anchor down in Wrightsville Beach by 5:00 beer hour. We'll head ashore for dinner in this familiar place. I've already booked Thanksgiving dinner at The Bridge Tender Restaurant. Long-time readers may remember we did all this once before, after our very first outside passage. I've changed the sorbents twice and the current set should last us all the way in. In the morning, I'll be on the hunt for an injector.